Everyday conversation, and the different ways humans communicate, was the subject matter highlighting a collection of prints from the University Museum Feb. 18 at the Edwardsville Art Center. Matty Kleinberg, visiting scholar in Printmaking for the SIUE Art Department, undertook the challenge of curating a collection of prints for the first time. Kleinberg selected from a collection ranging from the contemporary to early 20th Century. The exhibit, titled, “(Out of) Dialogue” showcases works from the SIUE University Museum’s vast collection. Kleinberg, who graduated from SIUE with a Master’s in Fine Arts in printmaking in 2008, browsed through SIUE’s vast collection looking for conversation pieces, a topic he felt that most people can relate to. Subjects included a piece that featured two elderly people who share conversations humorously to a musician sitting on the hood of his car playing his guitar on a sunny day by Robert Marx. One 1965 piece by Filipino artist Rudolfo Perez featured a print of a couple sharing a kiss. The month-long exhibition runs through March 18. Kleinberg also enlisted the help of SIUE MFA students Nicole Benner, majoring in textiles, and Joanna Hoge, who is pursuing an MFA in drawing. 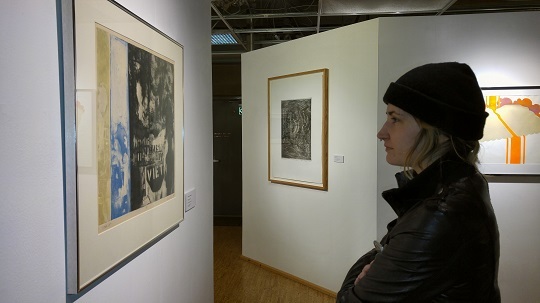 The students helped Kleinberg pull prints and help matte and frame each of the pieces, some of which had never been displayed, including a piece by Amy Worthen. Worthen is a Des Moines-based printmaker who utilizes the Iowa style of printmaking. Her piece, titled “Sank Gottard,” is a three panel black and white set depicting images from a Cathedral. 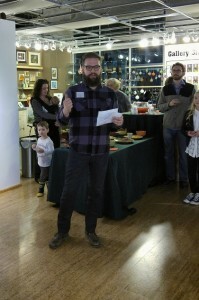 Klein was recruited by SIUE Museum director Erin Vigneau-Dimick to curate the collection. Dimick said she called on the 36-year old Kleinberg, a St. Louis native who had previously worked as a printmaker at Firecracker Press to introduce a different vision for an art exhibit for the Museum’s annual showcase. Kleinberg currently is managing and overseeing print collections within the SIUE art department. Dimick was Kleinberg’s professor during his time at SIUE.